SCinet is the SC Conference’s dedicated high-capacity network infrastructure, designed and built by volunteer experts from industry, academia, and government. Planning begins nearly two years in advance of each SC conference and culminates in a high-intensity installation that, for the duration of the conference, is the fastest and most powerful network in the world. Since its inception in 1991, SCinet has been pushing the boundaries of networking technologies and innovations through various workshops, demos, and activities, in addition to providing internet connectivity for conference attendees. SCinet supports the revolutionary applications and experiments that are a hallmark of the SC Conference and enables exhibitors to demonstrate the advanced computing capabilities of their solutions and services, whether in large-scale or one-on-one demonstrations. The essential advanced and commodity networking capabilities the conference needs to support large-scale HPC demos are all provided by SCinet. In recent years, SCinet has consistently delivered bandwidths exceeding 1 terabit per second and has had the opportunity to utilize new services and technology, such as pre-production software-defined networking and intrusion detection systems. Learn more about SCinet at SC19 on the SC19 Conference website. SC is an annual conference co-sponsored by the Association for Computing Machinery (ACM) and the Institute of Electrical and Electronics Engineers (IEEE) Computer Society. The conference focuses on the science and application of HPC and communication technologies. 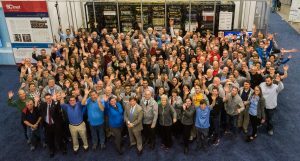 Since 1988, volunteers funded from academic, government and corporate organizations in the HPC industry have worked together to produce the SC Conference series. The conference attracts over 12,000 technical program attendees, exhibitors and exhibit visitors. SC has been the breeding ground for the technologies that now underpin services ranging from cloud computing, high-speed Internet services, and current ubiquitous computing architectures. Attendees are primarily computer engineers, computer scientists, computational scientists and managers/executives of computing facilities who use high-speed and high-performance computers for research and other technical applications. Executives, sales and engineering managers from companies involved in producing and selling HPC products and services also attend and participate. Learn more about this year’s conference on the SC19 Conference website. Copyright © 2019 WINS – Women in Networking at SC All Rights Reserved.